“Paid Game Player” or “PGP”, found at paidgameplayer.com, is a free to join gaming and Get Paid To (GPT) site that pays you to play online games and complete tasks and offers. Paid Game Player is a middleman of sorts for their third party clients that actually pay you for the tasks and trials they offer. There are different types of word activities to engage in at Paid Game Player like word and action games, puzzles, and product trials. You can also get paid to view ads and if you pay for the premium membership you can compete with others on certain games through your own “Compete For Cash” (and also prizes) account on Paid Game Player. You can also get paid or earn rewards by reviewing games, and bringing in referrals to Paid Game Player through their affiliate program as a premium member. Other games on Paid Game Player have a one hour trial limit to before buying. You earn points by playing those to be eligible to enter drawings. Although it’s been disclosed on their site, I wouldn’t say there is a conflict of interest but some of the owners of IM Report Card are also part owners of Paid Game Player, so take their review of it lightly. They will tend to be biased. 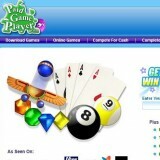 A bit of warning – Paid Game Player does offer gambling sites and you can lose money to them so be careful with those. There is not a lot of money to be made with Paid Game Player but most people go there just for the fun of it and drawings to win prizes. Some of those who pay to join the Paid Game Player premium service do so to avoid advertisement commercial interruptions during their game play. A few people have pointed out in their complaints that some games on Paid Game Player may be programmed with bots, or fixed robotic tricks to make you lose. There are complaints that a lot of Paid Game Player’s third party clients’ pay to play games use these bots to make you lose money on them after winning a couple of rounds, but there really is no way of telling. Paid Game Player does offer paid surveys but most are difficult to complete due to specific demographic restrictions or requirements. Sites like these and Paid Game Player itself run on ads from third party clients so any trial offers you choose to complete should be researched carefully before engaging in. The reason for this is that sometimes you are required to give out your bank or credit card information in order to purchase the products to try out. If you fail to complete the task and or return the product or cancel the trial you will be charged full amounts for those items or services. This could be detrimental to your bank account if you do a lot of trials and don’t keep track of them. Also, beware of malware, spyware and other such viruses and trpjans that can potentially harm your computer or phone, but can also put charges on your phone. Paid Game Player may not be responsible for such dangers but their third party clients could be offenders without their knowledge. Also be careful who or where you give out your personal info to through Paid Game Player’s clients and advertisers as some may use it for phishing purposes. Beware, too, of some of Paid Game Player’s clients that may ask you to pay for leads lists and or worthless training kits they claim could earn you reviewer credits or money. You take your chances when you use sites like Paid Game Player, and it could be that it tries to keep their games safe to use, but since there is si little to make from using this site I would not bother with it. While there have been a few users who claim they’ve mdae some money with Paid Game Player it has been so small that it’s not really worth writing home about but I don’t consider it a scam. It could be a fun hobby, but I do not recommend Paid Game Player as a way of making money online from home.